" I still don't believe, I have broken the world record. 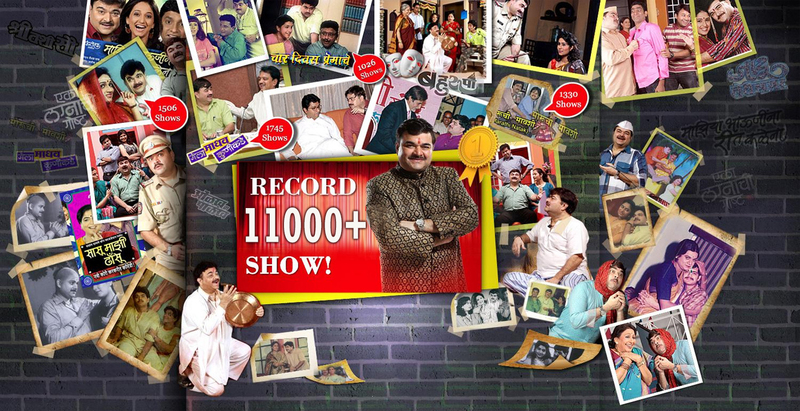 I am grateful to my wife Gauri and the Puneri Rasik for their prayers and moral support for the last so many years and particularly during the last three days," were the openings lines of Prashant damle, the extraordinaire theatre personality who may soon find himself in the Guinness Book of World Records, after his record breaking performances in five comic plays, in just one day. Exactly at the stroke of midnight on January 18, Bal Gandhaarva Rangamandir took on a festive mood with theatre personalities and art affcionados funneling in and out of the auditorium. Sound of Sanai Choughada, elaborate rangolis, bursting of crackers and the probing percussion of the brass band which belted out the theme song 'Char divas premache, char divas preetiche' supplemented to the cheerful mood of the people. 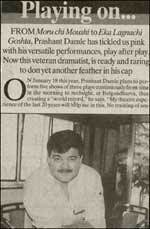 Prashant is not just the run of the mill kind of record seeker. In a span of 16 yrs, he has 6,538 performance to his credit, Says Prashant, "Performing non-stop for approxmetly 16 hours is not at all an facile task,But realizing the blind eye treatment given to theatre and to invite youth in theatre activities, I have made this attempt." Prashant, who can send the audience in instant splits with a flicker in his eyes or with his impromptu dialogues, got into action at 7.30 am on Thursday morning and performed five comic plays, staying on his indefatigable toes consecutively till 12 am in the midnight. Prashant candidly admits that working for such a long strectch does exert influcence on his physical state, but mentally he still remains charged up. Says he," However I cheese off ten days a year, from my hectic schedule. And go out with my wife and two daughters.